JoJo. So this is Casey's cousin, JoJo. First picture I made of her! She was ment to be dark blue, but her পশম wouldn't really fit her hair's color skeem, and I didn't want to change the hair. XP. 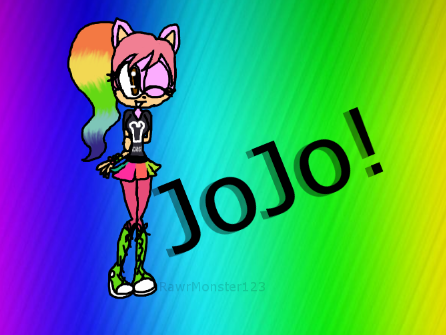 Wallpaper and background images in the Sonic অনুরাগী Characters club tagged: jojo. Jasc Paint ভান্দার Pro 8 ..::Rima in the making request::..
Zooey The শিয়াল is a rip off of Daniela. TUCH ME অথবা MY SWORD আপনি DIE!!!!!!!!!!!! MARY SUE THE MOST SEXIEST দুশ্চরিত্রা IN DA WHOLE FRINKKIN WORLD!!!!! Don't আপনি dare hurt my sister! Nope! I'll give you a hint: It has 5 letters in it. Then it starts with "T" and ends with "T".